Last night was the final lesson in Italian Step 3, which means I have my Tuesday nights back! I must confess that I completely slacked off in this course. First was the horrible 7:30 PM- 9 PM time slot, which meant I didn’t get home ‘til at least 10 PM starving but too sleepy to eat much. And then my coworker/ partner-in-Italian-crime couldn’t sign up for this level so I lost interest and fast. Shame on me. But I refuse to give up on my polyglot dreams so during this two-month break before the next level starts up, I’ll try to read through the three chapters (in our textbook Oggi in Italia) that we covered over the last two months. I might or might not do the homework I missed, which were all but the first two (what?! I’m a busy woman so don’t judge me). 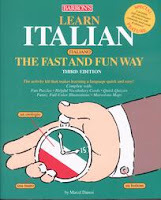 But honestly, I will probably resort to Barron’s Learn Italian the Fast and Fun Way. This is how my coworker and I started learning on our own last year during our lunch breaks. In fact, we may have only studied through page 55, but we still breezed through level 1 (because we’re awesome). The book makes it fairly simple to learn the language (as well as all the others they have in their collection: I bought the French one as well to brush up) and the cute cartoons keep my interest because apparently I’m a child with ADD who needs colors and pictures to understand concepts. Hey, whatever works! I might have to get that for my daughter. Might help to get hands on a Dummies version of the book too. Looks like Italian actually has 2 books. The first book has a disc that goes with it and the second book is Italian phrases. Might make a nice suppliment to the book you have. Ooh, I understood that! And "più" means "more." Oh snap! You just got schooled in Italiano! Che brava! Ho vissuto a Firenze per tre anni -- abitavo insieme al mio amante italiano (forse ne avevo due). Dovrei fare un post in Italiano per mantenere la practica. Sì, che bell'idea! Ma credo che sarà un po dificile per me e non me capirà nessuno (eccetto per lei)! Hmm, ok so that wasn't super hard, but I think an entire post would take quite a while. But that was great practice, thanks Blicky!! My post title had a huge past participle mistake! Why didnt any of you tell me?! I don't even know what a past participle is... LMAO... There goes a couple years of Honors English down the drain huh?